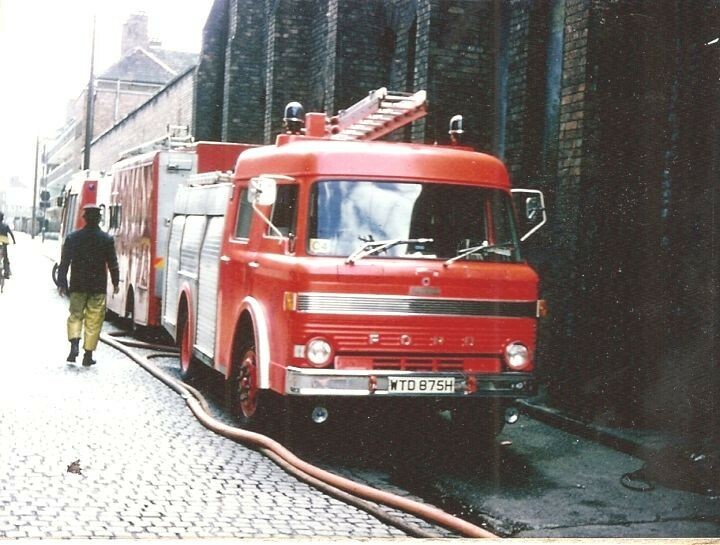 this appliance was one of a batch of Merryweather Marksmen ordered in 1973/4 by Lancashire FS, but by the time this photo was taken in mid 1975 it has been absorbed into the new Merseyside FB after the April 1975 reorganisation that created the so-called metropolitan fire authorities like Merseyside. At a warehouse fire in Liverpool. 2 Liverpool Salvage Corps tenders behind. Merryweather bodied appliances were fairly rare at this time and the company founded in the 18th century in London went bust in the 1980s after moving from Greenwich south east London to South Wales. This appliance was delivered to Crosby Fire Station in 1970 and was used by the Retained crew. It remained there into the Merseyside reorganisation until it was replaced, I do not know when that was. The other two Fords delivered to Crosby in 1972 where LTC 401K D1014 and LTC 391K D1617, both of which could carry the escape. LTC 391 usually carried the escape.All three went into Merseyside. Added by Colin Domville on 01 July 2012. Colin: I worked at Ford Truck SVO when these were delivered and was involved in developing and marketing the D series fire appliance chassis. Also, do you happen to recall the bodybuilders? I know both Carmichael and HCB Angus produced appliances on the D series chassis. Added by Rob Johnson on 21 August 2017. In another recent posting Rob says Reliant built this Marksman crew cab, I assume in glass fibre. Added by Petros on 07 November 2018. Yes, it was mainly glass fiber. They did use the Ford cab's steel structure and added the rear components in molded fiberglass, framed out in aluminum alloy. This resulted in a crew cab which was light enough to be full tilt, while the HCB and Carmichael D series fire appliances had a fixed crew compartment and only the original front cab could be tilted. The Reliant cab was also used by Pyrene, but it did not see much use anywhere else, as it was more expensive than the split cab solution and did not really offer any advantages over them. Added by Rob Johnson on 07 November 2018. So are the panels supplied by Reliant ? I would assume the actual l assembly was by Merryweather? I don't recal Reliant being a builder of fire engines. Added by Michael G. on 11 November 2018. Reliant were fiberglass specialist fabricators, and built various cars such as the Scimitar sports coupe and the delightfully odd three wheeled Robin. But they also manufactured front fascias for British Rail locomotives and various bus manufacturers, as well as these crew cabs. I always felt that if my former colleagues in Ford SVO had offered the Reliant cab as a Ford factory option they might have sold a lot more D series fire appliance chassis, as this made the body builder's job much easier - just like the current Scania.